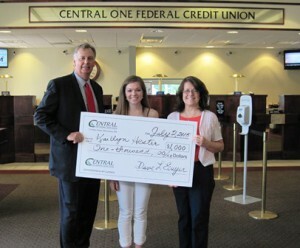 Region – Kaitlyn Hester was this year’s recipient of Central One Federal Credit Union’s $1000 William G. Whitten Scholarship. (l to r) – Michael Rooney, Central One CFO, Kaitlyn Hester and Joan Day, branch manager, Central One Shrewsbury. Kaitlyn, a recent graduate of Shrewsbury High School, applied for the scholarship by participating in the Cooperative Credit Union Association Scholarship Program. Central One extends its best wishes to Kaitlyn as she prepares for her academic career this fall at Westfield State University.